It was nearing the end of my year long voyage in India and I hadn’t yet conquered the art of making masala chai. While crashing at the home of friends, they began the very intricate process of teaching me to make what is, in my opinion, the most heartwarming drink on the planet. There are two recipes below. The first one is for ready made masala chai, to which you just add your spices to black tea, and the other is a recipe for fresh made masala chai. Store in a clean glass jar and use about 1/4 of a tbsp per cup of chai (to taste). Add the black tea, remaining spices and sugar and bring the pot down to a simmer for about 10-15 minutes to let spices marinate. Use a strainer to catch the loose tea and spices. Voila! You have a homemade pot of Indian chai. 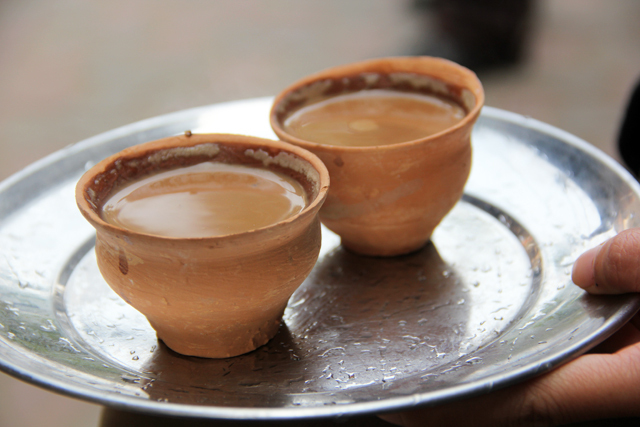 As chai is typically consumed in tiny teacups, sit back, relax and enjoy!